Published: Monday, June 20, 2016 The measurement uncertainty of a pyranometer in use depends on many parameters, some relating to the instrument performance and some specific to the measurement location. For monitoring the generating performance of solar power plants it is necessary to measure the amount of solar radiation arriving at the surface locally in real-time. When using this data to calculate bankability, efficiency, profitability, compliance with contractual targets and return on investment it is essential to know the uncertainty. Is it ± 2% or ± 5%? It can make a big difference to the bottom line. To make this simple, Kipp & Zonen has designed an application for IOS and Android tablets and smartphones to calculate the uncertainty in irradiance measurement for any given location. It contains a database of our pyranometer models and their specifications. The ‘quick’ mode allows you to make an estimate of the measurement uncertainty for a given location. Date, time and latitude will be automatically obtained from GPS data each time the app is opened. You can also manually overwrite this for a different location, or if GPS data is not available. Select the pyranometer model from the menu list, whether a ventilation unit is fitted and enter the tilt angle. Choose the sky condition and press ‘calculate’. An algorithm calculates sunrise and sunset times and solar zenith angle throughout the day with the uncertainty as a result. A more accurate estimate of the uncertainty can be made by using the ‘precise’ mode and entering the site-specific parameters; the direct normal irradiance (DNI), diffuse horizontal irradiance (DHI), longwave (LW) net radiation from the sky, and ambient temperature. 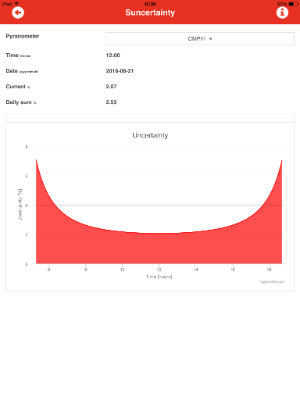 The App will not only provide you with an uncertainty for your selected time of the day, but it will also make an estimate for the uncertainty in the total daily sum of global irradiance. Once the uncertainty has been calculated for your conditions, you can quickly compare how the different pyranometer models will perform by selecting them in the pull-down menu. The level of confidence indicates the probability that the true measurement is within the quoted range. A level of 95% is often used, meaning that if the uncertainty in a measured parameter is ± 2%, the probability is 95% that the true value will lie within ± 2% of the measured value. Conversely, the probability that the measured value is more than 2% from the true value is only 5%. The reported uncertainty in Suncertainty is based on a level of confidence of 95%, scaled by a coverage factor k=2 (1.96 standard deviations for a normal distribution of values). Both systematic uncertainties and random uncertainties are accounted for. 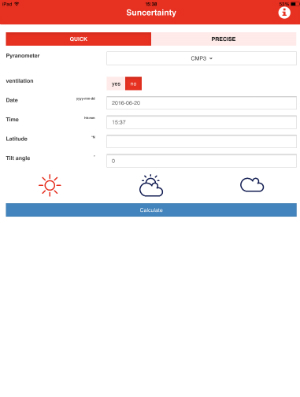 Suncertainty is a new, unique, and free application and an invaluable tool for all those involved in using solar radiation data in solar energy applications. You can easily see the improvement in measurement uncertainty by upgrading to a better pyranometer. Go to the Google Play Store or the App Store to download the app for free.